Okra is one of those vegetables that people feel passionately about. Either they love it, with a dedicated, all consuming love, or they hate it. Dan and I fall into opposite ends of the okra spectrum. He doesn’t want it within ten feet of his plate (or at least no closer than my side of the couch) and I can’t get enough of it. I want it fried, I want it stewed, and always (always) I wanted it pickled. 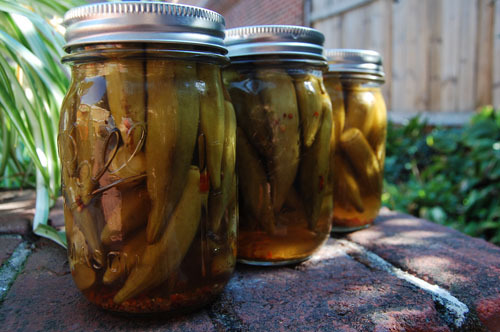 When I was growing up I used to love to settle into the the front porch with a good book and a jar of pickled okra. Nothing made me happier than the crunchy outside, the spicy vinegary flavor, and the unexpected pop of the seeds beneath your teeth. 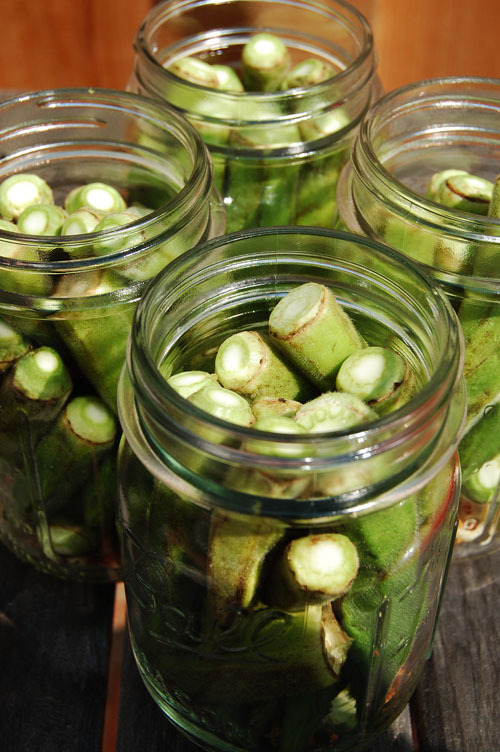 In my lifetime I have consumed an embarrassing amount of pickled okra, one jar at a time. And I don’t regret a bite. This year we grew okra in the back yard, which was a lot of fun. About a month into the plant’s existence what looked like a seed pod (the part of the okra you eat) appeared on the plant. Great news, except I had never seen a flower. 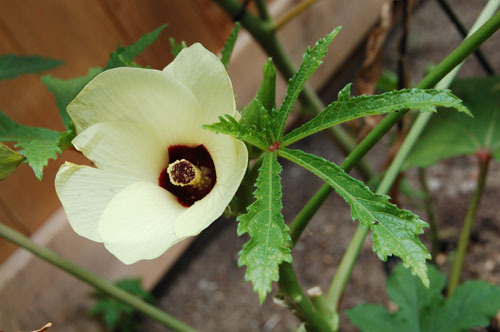 I consulted the interwebz and learned that the okra flower blooms for less than a day, so I just missed it. Afterwards I always felt a little rush of excitement when I caught the okra flowering, like I was seeing something secret. Because I’m a five year old, obviously. And because growing plants is a magical experience. 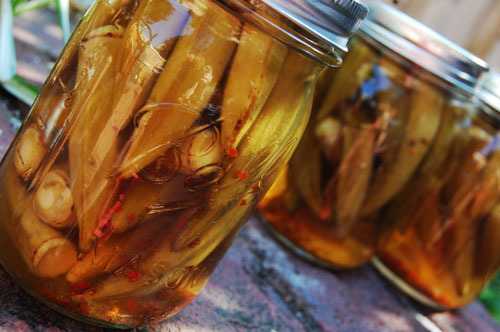 This is a traditional pickled okra recipe, similar to what any of your southern grandmothers make or what I spent my childhood eating on the front porch. Heavily vinegar based, like any pickle, and spicy, this is one of my favorite snacks. And definitely my favorite way to eat okra. In other news, this weekend I’ll be submitting a pie into the Cville Pie Fest in Charlottesville, VA. It’s a pie that is brand spankin’ new and might fail really horribly. In front of a lot of people. Come by and watch the fun! Great post! 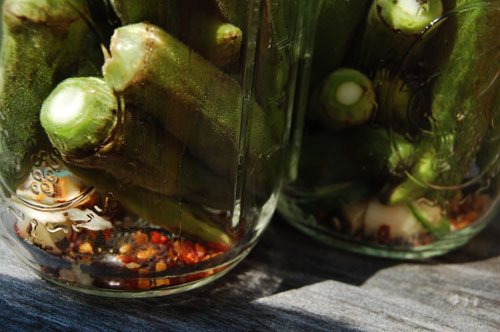 I can’t wait to eat pickled okra by the jarful now. Good luck in Charlottesville. Can’t wait to hear how you did. PS – I’m with Dan on okra. I really haven’t eaten enough okra to make an informed decision. However, I love just about anything pickled. Much luck with the pie! Great blog! I’m a fellow okra lover (that’s putting it mildly) and I’m also an urban apartment backyard gardener, in Brooklyn, NY. I will definitely grow okra this year and was considering Cajun Jewel…looks like it produced pretty well for you. Would you say so? How many plants did you grow? This year I grew 8 Cajun Jewels… we had a really great crop, though I kept missing them on the perfect days (okra goes from too small to way too big overnight) so I had a lot to keep for seeds! Good to know, about the okra going from small to extra large overnight! If you have extra okra seeds to spare and you’re interested in trading seeds, you can visit my “current seed inventory” page on my blog to see if I have anything you’d be interested in. I’m always happy to trade! I can’t wait to try these in a Bloody Mary. They are SO GOOD in a Bloody Mary! Totally the second best way to eat them!